Friday food is a weekly article about one of the more unusual food items to be found in Liuzhou that week. This week, we are getting hemped up. What you are seeing here are seeds. Cannabis Sativa seeds, to be precise. 火麻仁 in Chinese. Despite China’s well-known strict attitude to psychotropics, the cultivation of hemp for industrial and food use is permitted, provided it is a strain with lower concentrations of THC and higher concentrations of cannabidiol (CBD), which decreases or eliminates its psychoactive effects..
Hemp is used in the production of paper, textiles, clothing, biodegradable plastics, paint, insulation, biofuel, etc. Hemp seeds can be eaten raw, ground into a meal, sprouted, or made into dried sprout powder. They are also added to granola type mixes or used in breads, etc. 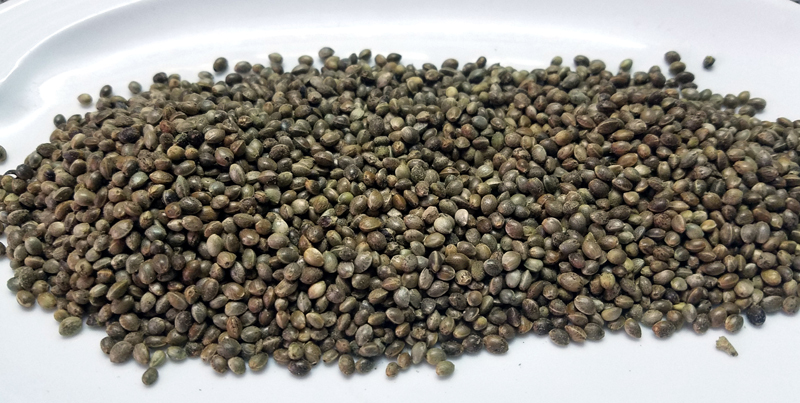 Hempseed oil is cold-pressed from the seed and is high in unsaturated fatty acids. The leaves of the plant can be consumed raw in salads. Hemp can also be made into a liquid and used for baking or for beverages such as hemp milk, hemp juiceand tea. As always, several health benefits are ascribed to hemp seeds, particularly for their vitamin B content and for roughage. Seeds are available for 30元/kg.
. This entry was posted on Friday, August 17th, 2018 at 7:00 am	and is filed under Friday Food. You can follow any responses to this entry through the RSS 2.0 feed. Both comments and pings are currently closed.